Would someone please buy this before I wind up buying it (again). This is my old Alfetta. I sold it a few years ago to some folks in Vermont. It was passed on to its current owner, who listed it on eBay last year. It was "sold" on eBay, but the buyer never completed the deal. You can find my original September, 2009, post about the car here. The seller has now included a video of the car running. The car ran a lot better when I owned it (it looks like the carbs can use a rebuild now), but it still sounds as great as it did "back in the day". It's fun to live in New England. Really. My ex-significant other and I had a house in the mountains of Western Massachusetts. There's a saying here; "Don't like the weather? Just wait a minute. It'll change." It's true. 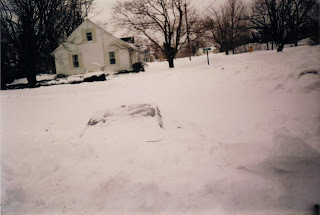 One March day back in the late 1980s it got up to around 45 - 50 degrees. 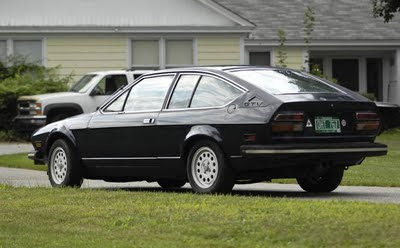 The Alfetta had been sitting in the garage since early October, so with the roads dry and the temperatures balmy (for New England in March) I decided to take the Alfetta for a drive to "blast out the cobwebs". All went well. It was a fun drive. The weather forecast called for rain that evening, so I decided to leave the car outside that night and let the rain wash off the dust that had accumulated on the car while it was in the garage. Good idea, right? It did rain... in the lower lying area where the local TV station is located. It snowed up in the mountains where we lived. It snowed a lot. Four feet of the stuff. I woke up to find the car buried in snow. Later, after 6 solid hours of digging and pushing, the car was back in the garage. I spent another couple of hours with towels and my significant other's hair dryer (which I burned out - gaining me no points or sympathy with her) drying it off. Lesson learned. OK, feel free to condemn me to hell. 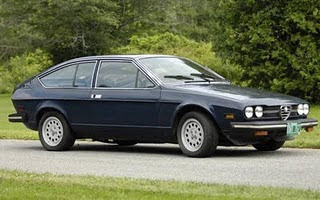 "Now, before you condom me to Alfa hell for leaving an Alfetta in the snow, let me explain..."
I will be in the same Alfa hell as you, my poor Alfetta has been sitting out under a madrone tree until I find time to clean the under-dash contacts. And ignoring my own blog for the last 2 weeks. Just buy the dang thing and be done (?) with it.